when you purchase a Pre-Owned Accu-Cut! All machines sold on a "first-come, first-served" basis. Call for complete details on our refurbished machines. Accu-Cut also has a wide selection of certified used carpet cutting machines for sale as well that we condition and provide a warranty with. We specialize in high quality, fast and reliable equipment. We take personal pride in showing each machine we refurbish our undivided attention. To ensure exceptional service to our unique consumer’s needs, Crescent Services is a devoted partner that refurbishes the machines for us. They not only have precise knowledge of the used carpet cutting machines, they offer local and out of state technical support. We support all of our consumers on their journey to success and sometimes leasing a used carpet cutting machine can be a great option for many business owners. What is great about our lease plan is that you can pay off the equipment at any time for principle only and no pre-payment penalty. Another great benefit to leasing is that you don’t tie up cash or credit lines. In most cases there is even no personal credit check required and most of the time no personal guarantee either. With leasing your initial out of pocket expense is lower, making it easier to acquire the equipment you need now. Accu Cut understands that small business’s need that little boost sometimes. We have some incentives to our leasing programs that shows that we are here to support your vision. We offer all the way up to 84 month financing options. A lot of times customers can upgrade their equipment to newer equipment and still keep their payment the same. In regards to leasing a new and certified pre-owned equipment, both are great options. An Accu-Cut certified refurbished machine is equipment we stand behind well into the next generation of ownership. In the world of carpet cutting machines we offer you quality, reliability, value and security, the highest standards of excellence. As an Accu-Cut owner you can always expect exceptional service and commitment from us to ensure customer satisfaction. When shopping for a pre-owned cutting machine there’s really only one thing to do: Think Accu-Cut. We’re certain there are some companies that don’t give their new machines this much personal attention. Accu-Cut insures that our pre-owned machines have passed our demanding inspection procedure. We leave no room for error or guessing when it comes to purchasing a certified used carpet cutting machine from us. Each machine goes through a mechanical, performance, and appearance test. Specially trained technicians go through under the machine and inside the control panel. Before we decide to sell it we much first be sold on it! Striving to be the best means double-checking our work. We’re going all out making sure it’s serviced, adjusted, repaired or replaced until we are impressed- now it’s your turn to be. We’d be delighted to have you come to any of our refurbishment centers to do an ultimate examination. We offer live demonstration’s to show you the standards of our reconditioned machines. Confidently we offer warranties covering full parts and labor on your certified used carpet cutting machines. The excitement of seeing your first roll of carpet or vinyl being cut on your Accu-Cut will surely instill a feeling of a decision “well made”. But that feeling won’t go away after the first week, month or even a year of ownership because owning an Accu-Cut will provide you with access to a level of service available to all Accu-cut owners. The backbone of the Accu-Cut ownership experience is a customer-support network of authorized technicians supported by our in-house service department whose number one priority is to ensure customer satisfaction. Where do we get used machines? Most of our used carpet cutting machines come from trade-ins. Many dealers find their business has changed from the time they first purchased their carpet cutting machine to where they go ahead and upgrade to a larger more advanced model. Others simply like to have a new machine every two or three years and trade-in their existing cutter for a new one. Is a used machine right for me? If you’ve never owned an Accu-Cut or you’re on a tight budget a pre-owned machine could be the best choice for your business. Most Accu-Cut machines perform the same tasks- they unroll, measure, cut and re-roll carpet & vinyl- the difference occurs in how efficiently and effortlessly they perform this task and sometimes the new models have additional features. 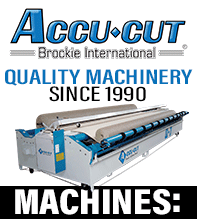 As with a new Accu-Cut machine, you want to ensure that your machine will meet your company’s cutting needs. Contact your Accu-Cut representative to find out if a Pre-Owned Accu-Cut is right for your business. Can I finance a used machine? YES! We offer many different financing options on all our used equipment including our lease-to –own programs featuring no penalty for early payment. Ask your Accu-Cut representative for complete financing details. Whether it’s a TRUMETER mechanical counter or the latest computerized electronic measuring system all pre-owned machines are certified accurate! Powered cutter travels the entire length of the machine and provides a straight, clean cut. Cutter styles vary from standard carpet blades to self-sharpening circular blades, but all work on both carpet and vinyl with the push of a button! Conventional motors and gear drives are positioned inside the frame of the machine for safety and protection. Our direct drive system is virtually maintenance free and will give you many years of dependable performance! Industrial strength casters allow Accu-Cut machines to easily be moved across a warehouse floor! The hallmark of an Accu-Cut machine is simple operation. Directional switches run the machine in forward and reverse and a convenient wrap around foot cable allows for operation away from the control panel. Many models feature variable speed control allowing a user to set their own comfortable speed or slow down the machine for detailed better inspection. The variable speed control also helps customers that are back-rolling carpet remnants to keep the rolls tight around the tube. Contact your Accu-Cut Representative today and discover if a Certified Pre-owned Accu-Cut is right for you.